Bing (known previously as Live Search, Windows Live Search, and MSN Search) is a web search engine (advertised as a "decision engine") from Microsoft. In October 2011, Microsoft stated that they were working on new back-end search infrastructure with the goal of delivering faster and slightly more relevant search results for users. Known as "Tiger", the new index-serving technology has been incorporated into Bing globally since August 2011. In May 2012, Microsoft announced another redesign of its search engine that includes "Sidebar", a social feature that searches users' social networks for information relevant to the search query. 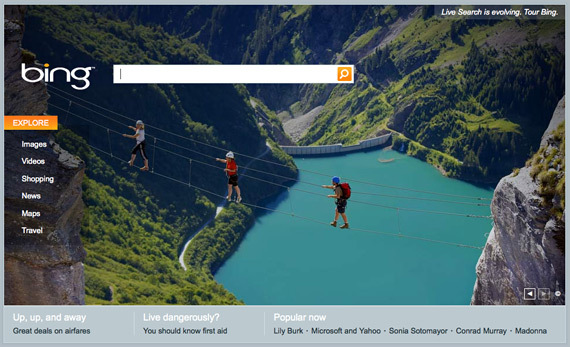 In September 2013, a new-look Bing was released to tie-in with Microsoft's "Metro" design language.